AjiPro®-L offers dairy nutritionists flexibility and simplicity with feed formulation practices. AjiPro®-L allows nutritionists to raise the proportion of lysine in total MP (Lys/MP ratio) without adversely affecting rumen fermentation. 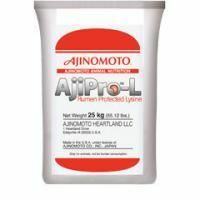 AjiPro®-L helps reduce the use of bypass protein sources in the diet and reduces the excess supply of protein to dairy cows, which would lead to improved protein utilization efficiency and, as a consequence, decreased excretion of urinary nitrogen into the environment. AjiPro®-L is composed of L-Lysine monohydrochloride (6.11 in AAFCO 2011), vegetable fat (33.2), and soy lecithin (87.5).